Overview - This diabolical thriller was the first film from director Danny Boyle, producer Andrew Macdonald, and screenwriter John Hodge (the smashing team behind Trainspotting). In Shallow Grave, three self-involved Edinburgh roommates—played by Kerry Fox, Christopher Eccleston, and Ewan McGregor, in his first starring role—take in a brooding boarder. When he dies of an overdose, leaving a suitcase full of money, the trio embark on a series of very bad decisions, with extraordinarily grim consequences for all. Macabre but with a streak of offbeat humor, this stylistically influential tale of guilt and derangement is a full-throttle bit of Hitchcockian nastiness. "That's what you paid for it. 500 pounds is what you paid for it. We don't know how much it cost us yet." Everything has a price. Everything has a cost. A heavy toll that weighs down on our lives, on our friendships, on our souls. It may be a cliché, but nothing in life is ever truly free -- least of all a big suitcase full of cash -- and as the characters in Danny Boyle's feature film debut, 'Shallow Grave,' gradually discover, the fee they're forced to pay for their "happiness" may be more than they bargained for. A dark, satirical thriller seeped in greed and paranoia, the movie is a fantastic display of low budget ingenuity and grim storytelling. With its pitch black sense of humor, suspenseful twists, and gruesome climax, the filmmakers weave a classic noir influenced tale of backstabbing, deceit, and severed limbs, that manages to carve a unique identity all its own. The story follows a trio of Edinburgh flatmates, David (Christopher Eccleston), Alex (Ewan McGregor), and Juliet (Kerry Fox) as they take in a new, mysterious tenant. After the boarder dies of a drug overdose, the group discovers a suitcase full of money left in his room. Unable to resist the allure of easy wealth, they hatch a plan to keep the cash. Unfortunately, their unsavory actions set off a slippery descent into greed and betrayal. As their once strong friendship starts to waver, the flatmates discover that they're not the only ones interested in the money, but outside threats might pale in comparison to the dangers that lurk within their own intimate circle. John Hodge's script is a gleefully twisted take on classic noir/thriller conventions. The plot bears heavy similarities to the works of Alfred Hitchcock, Henri-Georges Clouzot, the Coen Brothers, John Huston's 'The Treasure of the Sierra Madre,' and even the macabre style of Edgar Allen Poe. All of these various influences are molded and synthesized into a striking balance of dark wit and stark aggression that come together to form a very familiar yet still unique screenplay, perfectly suited for the film's low budget. An undercurrent of satire permeates the work and the deceptively simple setup leads to a harrowing climax that feels like a punch to the gut. Greed and violence are central themes and the manner in which Hodge examines their heavy affect upon the characters is quite powerful. In its own way, the movie really focuses on the fragility of friendship, and the dramatic dissolution of the main characters' relationships is both disturbing and riveting. Ultimately, this is a film about unpleasant people doing unpleasant things, and though there might be a few momentary bursts of commendable behavior, none of the characters are particularly likeable. Thankfully, the cast's performances are so strong that this never becomes an issue. These are squalid, selfish individuals who seem to be friends with each other because no one else would have them. Their insular, tightly-knit relationship makes their gradual betrayals all the more devastating. McGregor lends Alex a youthful, obnoxious arrogance and Kerry Fox creates a certain ambiguity in her performance that makes it hard to pin down her loyalties. The real standout, however, is Christopher Eccleston as the straight-laced David. His character goes through the most radical transformation, and without giving too much away, the actor does a fine job of handling the extreme personality shift. Director Danny Boyle starts things off with a burst of hyper-kinetic energy that anticipates the manic style of his follow-up, 'Trainspotting.' While there are tiny hints of that later film's aggressive aesthetic throughout, the director soon mellows out and falls into a much more methodical, reserved but still briskly paced rhythm. Slow moving pans, tracks, and push-ins are prevalent throughout, adding an uneasy sense of motion and escalation to the narrative. Uncomfortable angles and moody lighting are also common, and the bold colors and noir influenced shadows featured in the characters' flat help to enhance the slightly heightened atmosphere. The movie's climax is a masterwork of unflinching brutality, and Boyle shoots it in a way that is both raw and cinematic all at once. Though Boyle's first feature, the filmmaker was already a veteran television director, and this experience may account for the movie's remarkably assured style. Much like the Coen Brothers' debut, 'Blood Simple,' one can truly see the emergence of a real cinematic talent. Friendship, loyalty, trust –- these are all mere obstacles to overcome when money is part of the equation. No unsavory action comes without a cost, and in 'Shallow Grave' we see just how much some are forced to pay. A memorable feature film debut from Danny Boyle, the movie remains a suspenseful, funny, and disturbing descent into violence and deceit. With a trio of wholly unlikeable but expertly portrayed leads, the movie manages to entertain and thrill through a darkly, grim tale of blood and treachery. Like any great story about unsavory characters making poor choices, the climax leaves audiences with several moral quandaries and lessons learned. Beyond the obvious commentary on the pitfalls of greed, the real message here could not be more simple. Next time, dig deeper. 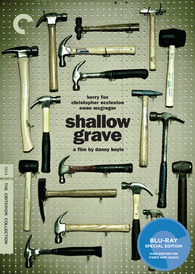 Criterion brings 'Shallow Grave' to Blu-ray in their standard clear case with spine number 616. The BD-50 region A disc comes packaged with a relatively slim booklet featuring an essay by critic Philip Kemp. The movie is provided with a 1080p/AVC MPEG-4 transfer in the 1.85:1 aspect ratio. Despite the film's low budget roots, the movie looks quite spectacular, with a sometimes gorgeous transfer fueled by sumptuous colors. The source print is in nearly pristine shape with no real signs of age or damage. A light to moderate layer of natural grain is visible throughout, adding a pleasing sense of texture to the image. Clarity is fantastic revealing various fine details in the filmmakers' modest but still very inventive framing and production design. The real highlight of the video presentation is the picture's surprisingly rich colors. The characters' flat is bathed in bold hues, and occasional splashes of color in various objects and wardrobe choices simply pop from the screen. Vivid reds and blues are especially eye catching, and coupled with the stark lighting design, the vibrant colors lead to a great sense of dimension. Black levels are deep and steady, and overall contrast is great without blooming whites. With no technical issues or notable print damage to speak of, 'Shallow Grave' comes to Blu-ray with an impressive and authentic transfer. Thanks to sharp clarity and vivid colors, the filmmakers' moody compositions and design work shine through wonderfully, creating an effectively creepy visual atmosphere. The movie is presented with an English DTS-HD MA 2.0 Surround mix. Optional English subtitles are also provided. Though there are a few issues here and there, this track does a solid job of enhancing the film's mood and atmosphere. Dialogue is mostly clean but there can be a slightly muffled and faintly echoey quality to speech at times. This may have something to do with the matrixed nature of the 2.0 surround track, causing some of the dialogue to softly bleed to other speakers. As a whole, the film is fairly quiet with a small and confined soundstage that is mostly relegated to the front. With that said, there are some lively moments peppered throughout, particularly with the soundtrack which mixes moody score with thumping house music selections. A scene set at a fundraiser dinner party is also noteworthy, featuring energetic ambiance. Surround activity is fairly sparse, however, and outside of the aforementioned ambiance, rear activity is mostly consigned to a few music cues and some isolated, creepy effects. Directionality is also infrequent, but there are a few specific audio pans (mostly cars driving by) that display decent imaging. Unfortunately, balance can be an issue, and there are times when effects and score start to overpower dialogue. Thankfully, this is infrequent, and the majority of the presentation is stable. While not as enveloping or nuanced as one might hope, the track still does a nice job of bolstering the movie's grim atmosphere and the sound design can be quite inventive. Considering the project's modest roots, the mix is more than serviceable and should certainly please fans. Audio Commentary by Danny Boyle - Director Danny Boyle provides a fairly interesting solo track. The filmmaker discusses working within the film's modest financing and provides lots of advice for getting the most out of small budgets. He also details the entire production process, focusing on the movie's casting, rehearsal procedure, set construction and score. Boyle comes across as very knowledgeable and offers a steady stream of fun trivia and technical bits throughout the commentary. Fans of the flick and any budding low budget filmmakers should definitely take a listen. Audio Commentary by John Hodge and Andrew Macdonald - Screenwriter John Hodge and producer Andrew Macdonald sit down together for this track. The genesis of the script, influences ('Blood Simple' was a big one), and themes of the story are touched upon along with more budget and production trivia. The pair also discusses Danny Boyle's sometimes extreme directing methods and the editing process. While some of the information is repeated from the previous track, there are still lots of new interesting morsels to hear. Interviews (HD, 29 min) - Recent interviews with stars Ewan McGregor, Christopher Eccleston, and Kerry Fox are included in 1080p with Dolby Digital 2.0 sound in this retrospective featurette. The three actors provide lots of details on how they got involved with the project, prepared for their roles, and what it was like to work with Danny Boyle. They also share several interesting stories from the shoot and discuss the film's themes and lasting impact. Video Diary (HD, 9 min) – Provided in upscaled 1080i with Dolby Digital 1.0 sound this is an amusing video diary from Andrew and Kevin Macdonald filmed during the 1992 Edinburgh Film Festival. The two interview various attendees (including Robbie Coltrane, Christopher Lambert and Samuel Fuller) asking them for advice about how to get 'Shallow Grave' (at the time only a script) made. Digging Your Own Grave (HD, 30 min) - Directed by Kevin Macdonald, this is a documentary on the film’s production that is provided in upscaled 1080i and Dolby Digital 2.0 sound. Lots of behind-the-scenes footage is included along with an intimate peek at some of the difficulties the production faced during the shoot. Stripped down and free of promotional fluff, this doc does a nice job revealing the incredible stress and pressures that come from film production. Trailer (HD, 2 min) - The film's trailer is included in 1080p with Dolby Digital 1.0 sound. Trainspotting Teaser (HD, 1 min) - A teaser for Danny Boyle's follow up to 'Shallow Grave,' 'Trainspotting,' is included. Danny Boyle's 'Shallow Grave' remains a darkly commanding debut from the celebrated filmmaker. A simple, classically plotted thriller with a macabre sense of humor, the movie thrills and shocks with a stark sense of dread and brutality. The video transfer is fantastic, offering surprisingly rich colors and clarity from such a low budget production. The 2.0 surround mix has a a few small issues, but still provides a very solid experience. The supplements are full of trivia and technical tidbits that give fans a comprehensive look at the picture's production and release. This a nice disc from Criterion for a very good film. Recommended.